The GOP’s hatred of birthright citizenship, led by Trump, is oh so very European. 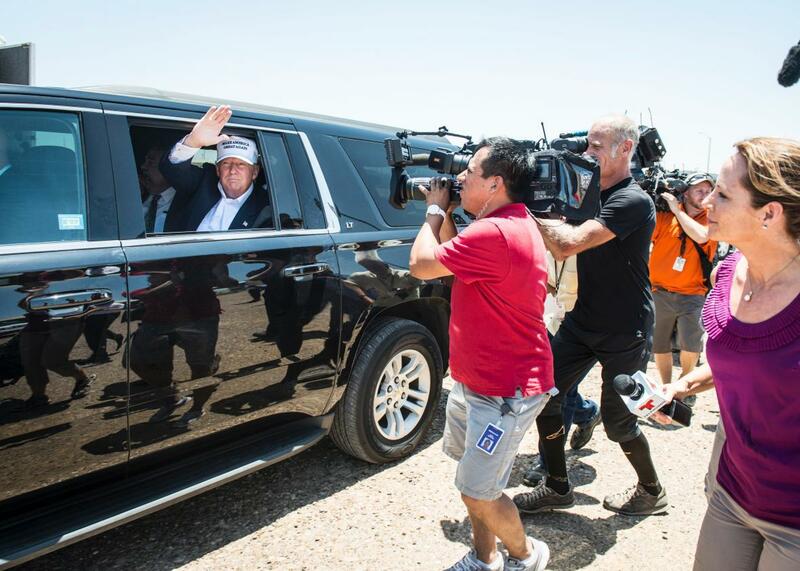 Donald Trump talks to media from his car during his trip to the border on July 23, 2015, in Laredo, Texas. The repeal of birthright citizenship has become a major topic of debate in the GOP presidential primary since Donald Trump released details of his immigration plan on Monday. Trump’s plan includes ending the practice by which citizenship is conferred on anyone born in the United States, regardless of whether his or her parents are citizens. Now rivals, including Scott Walker, Bobby Jindal, and Chris Christie, are calling for a re-examination of birthright citizenship. Marco Rubio and Jeb Bush, by contrast, have said they don’t support repeal. This isn’t the first time birthright citizenship has come under fire. Proposals for ending birthright citizenship emerge periodically from Congress. And presidential candidates Rand Paul and Lindsey Graham have questioned it in the past. Birthright citizenship is rooted in the 14th Amendment, which grants citizenship to “all persons born or naturalized in the United States,” including recently freed slaves. The amendment itself had precedent in the British legal concept of jus soli, “law of the soil.” It was then firmly established by the Supreme Court in the 1898 case of United States vs. Wong Kim Ark, which involved the San Francisco-born son of Chinese immigrants who successfully argued that he had been illegally denied citizenship rights. While some legal scholars have argued that birthright citizenship was never meant to apply to the children of those who illegally enter the United States, changing that interpretation today would be difficult, likely involving either a constitutional amendment or the Supreme Court overturning a century-old decision. One thing that opponents of birthright citizenship get right is that the interpretation of the concept under U.S. law is unusual, particularly among major world economies. As the restrictionist think tank Center for Immigration Studies has pointed out, only about 30 countries grant birthright citizenship to any child born in the country, regardless of their parents’ citizenship. Trump’s policy paper suggests that birthright citizenship “remains the biggest magnet for illegal immigration.” But the experience of other countries that have placed restrictions on birthright in recent years—Australia (2007), France (1993), and Britain (1983)—suggests that these limits do not make the countries less attractive to migrants. More restrictive citizenship laws also wouldn’t necessarily cut down on fraud and abuse. German law, which allows children born in the country to noncitizens to claim citizenship only if their parents have lived legally in the country for eight years, has created an underground market in false paternity, in which German-born imbissvaeter , or “fast food fathers,” claim to be a child’s father for a fee. One need look no further than the unfolding catastrophe on the Haitian-Dominican border, which I reported on last month, for an example of the ugly consequences of removing a large population’s right to citizenship. But the Trump-led assault on birthright citizenship is less about these practicalities than it is a populist, nationalist attack on the uniquely American (or, at least, American in the regional sense) definition of citizenship—one defined more by where you were born than by family history, as it is in most other countries. This is worth keeping in mind the next time Republicans accuse the Obama administration of trying to make the United States more like Europe.